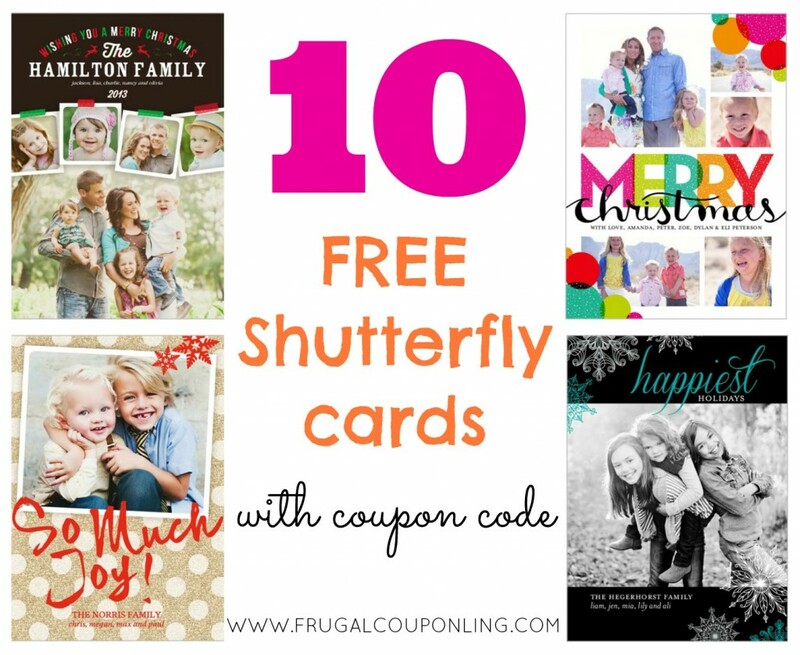 10 FREE Shutterfly Cards Ends 11/27 – Christmas Cards! Head to Shutterfly this 3 days ONLY and get 10 free cards! Choose from 6×8, 5×5, 4×8, 5×7 flat cards, 5×7 folded or 5×7 trifold. If you don’t need holiday or Christmas cards, think ahead for graduations, birthday invitations, Halloweeen, Thanksgiving, Valentine’s Day, Mother’s or Father’s Day cards and more. Just create your card, add 10 to your cart, and enter code 10FREE at checkout. Please keep in mind that accounts are based on email addresses. Offer ends 11/27/16. Head to Shutterfly for a look! Find more Photo and Deals on Frugal Coupon Living. 10 FREE Shutterfly Cards Ends 10/23 – Christmas Cards! Please keep in mind that accounts are based on email addresses. Offer ends 10/23/16. Please keep in mind that accounts are based on email addresses. Offer ends 10/2/16. Are you a thank you note writer? I love receiving old fashion (meaning non-electronic) thank you notes. You can tell heart went into the thanks! Today get a great deal on stylish, personalized thank you notes from Tiny Prints. They are selling all of their more than 1700 designs for 40% off. Personalize them by adding your own text, choosing your font, and even uploading your own pictures if you choose! I really love the style above – Flowery Accolade – how cute is that front and back? Use promo code 0310DEAL during checkout. This offer ends 3/11/16 at 8:00 AM PT. Head to Tiny Prints for your 40% off Thank you Note sale. Cyber Monday is here, which means a great holiday savings all around including Cardstore! Cyber Monday is a great day to kick back with a cup of coffee, eat some Thanksgiving leftovers, and enjoy all the great deals online. Cardstore provides an amazingly simple, fun way to create my holiday cards. The best part is they’ll mail my cards for me so I don’t have to leave the house for stamps or deal with the crazy post office! Use coupon code DDCCN5693 for 69¢ Flat Holiday Cards and coupon code. At Cardstore, check out this fun thing on their blog – a Rustic Chalkboard makes a very adorable Christmas Card display. I love creative ways to share your friends Christmas Cards. I also love this Washi Tape Tree – it makes a fun Christmas tree display. Don’t forget we have an Elf on the Shelf with a fun Washi Tape mix up! One fun feature, Cardstore lets you pick your delievery date if you want to ship it directly to your recepients. Free Shipping on orders $30 or more! Expires on 11/30/2015. Like the Cardstore Cyber Monday Sale? Find more Cyber Monday Deals, Seasonal Deals and Christmas Deals on Frugal Coupon Living. 24 FREE Tiny Prints Labels Today! Head to Tiny Prints today and get 24 Custom Address Labels for FREE! I did the fun designs above with Tiny Prints Labels. We have used them with with gifts (identifying the sender) but my favorite way of using them is labeling gifts from Santa! Of course, they would be perfect with Christmas Cards! Shipping is around $4 or $0.16 per label. This offer expires 11/27/14 at 11:59 PM PT. Use coupon code 1127DEAL at checkout. Find the FREE Tiny Prints Labels Code and MORE FREEBIES on Frugal Coupon Living. Head to Shutterfly this 3 days ONLY and get 10 free cards! Choose from 6×8, 5×5, 4×8, 5×7 flat cards or 5×7 trifold. Just create your card, add 10 to your cart, and enter code 10FORME at checkout. Additionally, this code also gives you 50% off Holiday Cards should you want to order more than 10! There is no other purchase necessary for the 10 free cards. Please keep in mind that accounts are based on email addresses. Offer ends 11/29/15. Also pick up 24 FREE Return Address Labels – I often use these as gift tags! Today only, get a great deal on stylish, personalized thank you notes from Tiny Prints. They are selling all of their more than 1700 designs for 50% off…for less than 24 hours. Use promo code 0716DEAL during checkout. This offer ends 7/16/15. Head to Tiny Prints for your 50% off Thank you Note sale.